This article assumes that you're going to build a ground level railroad on a crushed gravel roadbed, without doing any carpentry. Because you want to keep your track more-or-less level, you'll need more landscaping materials, especially crushed gravel, if there is a slope. If the slope is extreme, you'll have to consider that the "terrace" or "retaining wall" you create to support your railroad will take as much time or more to build as the railroad itself. In addition, any railroad-building activity goes better with one or more able-bodied helpers. What About Planning? Ordinarily I recommend all sorts of research and stuff before you get out the shovel. If you have time for that, go for it. But don't let planning get in the way of getting something fun in the back yard, even if you wind up changing it later. For one thing, you'll learn things just by putting out a small railroad that will affect the way you plan your "final masterpiece" anyway. And this way if you do start a bigger project later, you'll have something to show people when your yard is full of dirt piles and folks wonder what you're trying to accomplish. Is Bigger Better? Generally, especially when you remember that trains look better and run better on bigger circles of track. A very small railroad (using a 4' or 5' track circle) will go together in a few hours, but frankly doesn't offer nearly as much opportunities for viewer interest as a larger railroad. On the other hand, a larger railroad (using an 8' or 10' track circle) will be far more rewarding in the long run, but it will require three to four times as much mulching, etc. The larger setups described in this article will work better for you if you can line up good help, get all of your materials ahead of time, and set aside a whole weekend to work with (just in case you go over a little). What About A Water Feature? It is impossible to install a pond of any sort and a garden railway in one day, or even one weekend. If you need a water feature, you might consider buying one of those preformed "waterfalls" or "ponds" made from resin or vinyl. The great thing about those is that they can be installed at any time (unless you buy one of the huge ones). If you're planning on setting it up the same day you set up the railroad, make certain it's the kind you can just set in place, dump some water in, and plug in. Set out Your Buildings' Foundations. A starter set, a train set with track and power supply. I like AristoCraft starter sets because they come with a remote control and their track can be left outside indefinitely, unlike Bachmann's. But the important thing is to have some sort of starter set by the time you are ready to start your railroad. Some pre-built buildings, especially stations, so all you have to do the first day is set the things out. (Even so-called "snap-together" kits are a little complicated to put together on the same day you're trying to get everything else accomplished.) Regarding number of buildings, less is more, when you're starting out. I'd probably keep it down to one or two buildings per every 24 square feet of railroad, at least until you have a better sense for how the whole railroad is "coming together." Extra track. Though a 4' circle of track comes with your starter set, you should consider ordering a bigger circle of track for your outdoor railroad. even a temporary one. Trains look better and run better on larger curves. In addition, you would be surprised how small this circle of track looks outside. If you are very cramped for space, consider a 5'-diameter track circle. Far better would be a 10'-diameter track circle . Yes, a 10-foot diameter circle of track may seem big while you have a box of track in the house, but you'll find that it looks "about right" in your yard, as long as you can fit it in. My friends say that it is possible to put a railroad based on 10-foot curves up in one day if you're very organized, so if you have room, consider it strongly. You can also extend any circle into an oval with some 1' or 3' straight pieces. Some little people, in about the same scale as your trains (you can usually accomplish this by ordering the same brand name figures as the brand of your trains, but it's not always possible). Start with just a few, to give a sense that your railroad is not circling a ghost town. The Best Choices for Beginning Garden Railroaders page recommends several products that are especially useful for people just starting out. If you don't have any buildings or figures, don't panic, you don't have to have them. But if you don't have a train, get "cracking." Which starter set you need is not critical. I like AristoCraft starter sets because they come with a remote control and their track can be left outside indefinitely, unlike Bachmann's. But the important thing is to have some sort of starter set by the time you are ready to start your railroad. You'll need at least a shovel. If you plan to dig a trench for your track (see below), you'll want some sort of narrow-bladed spade as well, or at least a flat-bladed sod spade. And it wouldn't hurt to have a trowel, a couple screwdrivers, a measuring tape, a pair of scissors, a level, a garden hose, a knife, a one-or two-gallon bucket, a big level and a little one, and a carpenter's square onhand. If all of these things aren't in your garage at this moment, consider adding them to the shopping list below. Also, if you plan on cutting landscaping timbers, you'll wish you had a circular saw. I have a list at the end of this article, so you don't have to remember everything now. That was easy, wasn't it? Well, the next part will cost you a little more money. This is the part where you spend real money. Sometime before "the day," read the following explanations and fill out the "shopping list" at the bottom of this page. If you're planning on putting the railroad where there is now a lawn, a day or so before "the day," mow the grass there as low as you can get it. If you're compulsive, you can turn the soil or something, or rescue the sod to use in a bare place on your lawn, but I leave that up to you. If the soil where you're going to put your track is disturbed or loosened, you will have to tamp or stomp it back firm before you put your track down again, though. If you can possibly make your run to the hardware/gardening supply store before the morning of "the day," please do so. In addition, if you are building one of the larger railroads described on this page, you will need to make two or three trips to make certain the gravel and other heavy products, don't mess up your minivan's springs or axles. If you wind up making your run on "the day,"be sure to put a bunch of water bottles into the refrigerator to chill before you leave the house. Avoid beer-you'll need your wits about you when you're digging things up and screwing things together. Leave the garden hose out in the sunlight so it can get flexible. If someone coherent will be at home while you're at the store, have them get the track out of the box and put it together into a circle (or oval or whatever you have enough track for) outside where your railroad is going go. That way when you come home, you can plan on the exact location of things as soon as you unload the minivan. Crushed Gravel or Crack-Resistant Concrete - You'll want some finely crushed gravel to set your track in even if you use concrete (below). But if this railroad is potentially temporary (say for a rental property, or just for a placeholder while you build the "real" railroad something else, just go with gravel. Be sure it is crushed, not rounded. If you can pick anything up early, try to get this first, or at least know where you can get it in a hurry. Any crushed gravel in which most or all of the pieces are smaller than 3/8" will do fine, but you would be surprised how difficult this may be to find on short notice. I use crushed granite turkey grit that I buy from the feed store, but you may be able to find a cheaper and more convenient source near your home. You may wind up buying it at a gravel pit, a very interesting problem if you don't own a pickup truck with a good bed liner. 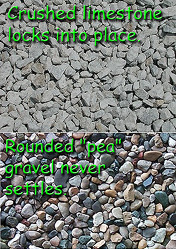 Whatever you do, don't break down and buy rounded gravel like "pea gravel" because you can't find anything else. 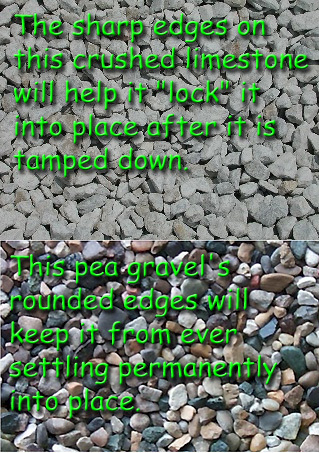 Pea gravel and similar rounded rock and pebbles never lock into place to hold your tracks secure. Some big box hardware stores sell a "paver" base that is mostly crushed gravel, so this may be useful. However some brands of "paver base" are ground so fine that you might as well be using sand (not a good choice). You're going to be using this to create a roadbed and to ballast your track, so the amount you need depends on how much track you have. Generally if you buy gravel by the bag, you're buying 1/2 a cubic foot of gravel per bag. In theory, one bag ought to supply enough gravel for a 60" length of track if you don't trench (see below) or a 30" length of track if you do, but in practice, you'll find yourself using the gravel to compensate for low places in the soil and for other reasons, so pick up some extra. You will also use the gravel to help level the bases for your buildings; a bag for every three buildings is a useful estimate. In addition, if you need more than, say 3 cubic feet of gravel (see suggested amounts below), plan on making multiple trips; there's no sense endangering your tires, axle, or springs. Note from 2008: If you live where weeds may be a problem, and you are absolutely sure you are going to leave the "right-of-way" for at least five years, where you place it the first day, you might consider pouring Crack-Resistant Quikrete or some similar concrete mix into the trench instead of gravel - it will keep things stable much longer and keep weeds from rooting down through the track. (The Crack-Resistant mix has plastic fibers that help keep the concrete from shifting and cracking, a valuable feature if you live above the Mason-Dixon line.) A single bag of Quickrete should fill about 60" of a 4"x4" trench, half that for a 5"x6" trench and so on. You'll pour the concrete in dry and wet it down to set it, so the mechanics of installing concrete are pretty similar to the mechanics of installing gravel in a trench, except that concrete comes in heavier bags. I added this note because I didn't use concrete underneath my right-of-way when I installed the first part of my railroad, and came to regret it later. Pressure-treated landscaping "timbers" - probably your fastest solution if the ground is very flat; also fairly inexpensive. Pavers, solid bricks or other masonry product - If you would like the look of pavers or some such surrounding your railroad, go for it. Get something heavy and stable if you can afford it - kids will walk on them, and if they're top-heavy, someone or something could get hurt. Don't buy those trapezoid-shaped things they use for retaining walls unless you plan to have a bunch of dirt or gravel hauled into raise the level of your railroad, generally not useful for a 1-day project. Weed Barrier Fabric - Get the intermediate stuff (five year warranty at least) even if you only plan to have this railroad out for a year or two. The stuff that's warranteed for "one year" is really only guaranteed for one summer if you think about it. Get enough to cover the entire area you plan to use for your railroad, unless you're working around some plantings or a pond, in which case, do your own math. Note: Almost nobody else recommends putting this everywhere at first, but my experience says that it's a lot easier to install at first and peel back as your plants and other things fill in than it is to keep weeding huge patches of ground that you don't get around to getting in groundcover or whatever as soon as you plan to. Also, pick up a bunch of "staples," wire things like little croquet wickets, that are made to hold the fabric in place. Mulch - Get enough to cover the entire area you plan to use for your railroad, say 3"-4" deep (this is deeper than the bag says you have to go, but part of the "1-day-railroad" process is that the mulch provides extra pressure on the weed barrier for the first few days while plants underneath it are still trying to get through it). If your railroad is up against your house, consider a cedar mulch, since it's less likely to attract termites. Also, if you have a choice, select a mulch with relatively small "chunks." Several preformed "stepping stones" - You'll use these for the base of your buildings. I like to use the plain concrete 2x8x16s, 2x12x12s, and so on, although I have a round stepping stone under my water tower. If you can measure your buildings ahead of time, you'll know what size of stones you need. Bigger is better than smaller, as you can always toss a little gravel or mulch over anything that's too obvious. If you don't have any buildings yet, get some 2x12x12s or 2x12x18s anyway, and install them when you install the rest of the railroad - it's a lot easier to "lay the foundations" for your buildings before plants and trains and stuff are in the way. You might also find it useful to get a couple stepping stones into the center of your railroad where you don't necessarily need them for buildings, so you have a place to stand when you're working on something. Electrical Wire to get electricity to your garden. If you have a GFI-protected outlet you can use, you should be relatively safe running an extension cord over to it initially. Remember to unplug everything when you're done running and not to run over the extension cord with your lawn mower. However, for a small railroad with one train and a remote control, it's usually safer to leave the part that plugs into the wall in the house, and to get some heavy cable to carry the low voltage current from the house to the trackside receiver. You can even cut a slit in your sod and sneak the low-voltage wire into it. That said, whatever you do, don't bury an extension cord in your lawn or use an extension cord at all if you don't have a GFI-protected outlet. If you don't know what GFI means, ask the salesperson at your hardware store. Irrigation System - According to my friends in greater Sacramento, if you live in a very dry area where you will need to use drip irrigation to keep things alive, pick up a "starter kit," which should include about 50 feet of 1/2" line, about the same amount of 1/4" line and some drippers. Note: If you install an irrigation system, don't install it over the wires from an out-of-the-box low voltage lighting system. In Ohio, we don't usually need irrigation, so I don't have to worry about that. But if you live somewhere you will have to irrigate, you might consider having one part of your garden watered and one part lit (for now at least). Plants - Garden railroaders use many more kinds of trees and plants than I've listed here, but these are carried in most garden supply stores in most parts of the country, and they'll get you started, especially if you only have time for one or two stops. 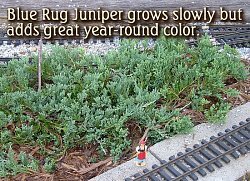 Note: Much more information on these plants is included in the Family Garden Trains articles: Groundcover 101 and Inexpensive and Low-Maintenance Plants for Garden Railroads. Little Trees - Most garden railroaders start out with Dwarf Alberta Spruce and other dwarf and slow-growing evergreens. 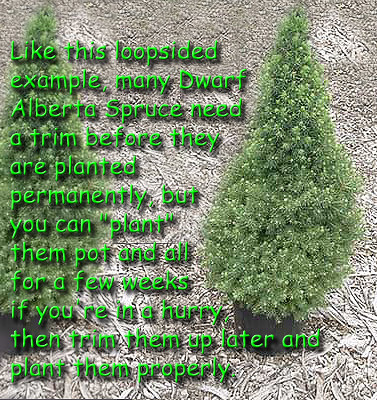 You're going to want to keep Dwarf Albertas at least a foot apart (they lose needles and attract pests if they're crowded), so a few may do for now. I've used several slow-growing Arborvitae with success as well, including Hetz' Midget and Berkman's Golden (they'll need trimming later). On a personal note, the Dwarf Alberta Spruces and other dwarf evergreens I've planted over the years are attractive all winter long, even when I'm not running trains, so think about the whole year as you're planning the "green" part of your garden. One deciduous tree that is expensive, but will attract favorable attention as long as you own it is a Laceleaf Japanese Maple. I haven't killed mine yet, and that's saying something. If you're running out of time and you don't have access to any of those trees, get something cheap that looks nice for now, and plan on putting it in the ground pot and all for now, then replacing it when you come up with something more suitable. Worst case is a plant like a full-sized cedar or juniper, which people buy when they're little and cute, but which can shoot up several feet in one rainy spring, with roots to match. Ground Cover - If you can find something suitable. 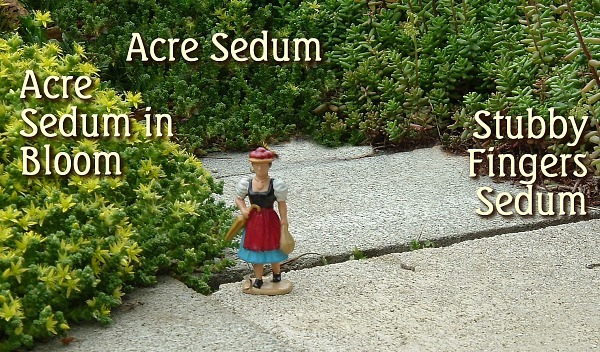 Look for small sedums with small "leaves," Irish moss, or Creeping, Woolly, or Elfin thyme. Don't be tricked into buying something like Pachasandra or Periwinkle, which look great around your front porch, but will take over a well-watered garden railroad like Kudzu. If you can't find anything at all suitable on your first trip, let it go - you can always add something later. 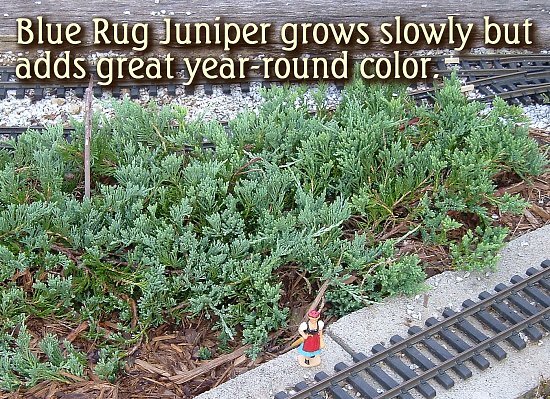 An evergreen groundcover that is attractive all year-round is Blue Rug Juniper. Plan to plant it where you won't be digging things up around it too often. Other Perennials - If your eye catches something else that looks like it might work, say Threadleaf Coreopsis, check to make certain it doesn't usually get beyond 12" tall or have any weird care requirements you won't get around to. Annuals - Nobody says you can't use peonies, petunias, begonias, and other popular bedding plants to give some summer-long color to your railroad, especially for the first year or two while your conifers and perennials are getting established. Bedding plants will look better if planted en masse somewhere than interspersed among the conifers and buildings. Coming up with a "color scheme" before you get to the store is probably a good idea. Whether you want to incorporate colors from your train or the buildings you selected is up to you. Planting Soil, especially if the place you're putting the railroad has really bad soil, or you don't know what kind of soil you have. One bag will probably do three small trees, six perennials, or 9 groundcovers. A can or two of cheap white spray paint for marking your boundaries and the route of your track before you get out the spade. If you don't have any buildings to set out, run past the bird houses and bird feeders to see if you can pick up anything that will work as a "placeholder" until you get something nicer. As an option, if you want to install a set of low-voltage landscape lights, get a set. You really shouldn't install these if you are going to install an irrigation system, though. The most expensive option would be if you wanted to install one of those resin "waterfalls" that look like real rock. Don't be surprised if it costs more than your starter set did. Unlike an in-ground pond (which nobody in their right mind would try to install on a day when you're also installing the railroad), you can install one of these later if you remember to leave room for it. Now, if you actually waited until "the day" to do your shopping, you have now been wandering Lowes or wherever all morning and your blood sugar is getting low (also your blood pressure probably spiked when you signed the charge card slip). Stop by someplace where you can get a healthy lunch fast; you're running out of time, and it will be way too hot to work comfortably by the time you get started anyway. Have someone else drive while you eat your lunch, and have them park as close to your future railroad as they safely can, without driving over the septic tank and making your day even more interesting. Change into grungy clothes (unless you had the nerve to wear your grungies to the store), put on sunscreen and a hat, grab a water bottle and head outside. If someone has set the track out for you (or you did it the night before), you'll have an idea where things should be. Move the track around so that you will have a good view from your optimum viewing position. If you have an oval, try to put it so that the straight parts aren't exactly parallel with your porch or whatever - that's boring. If you really have time, you may set out the buildings you plan to use around the track in various places. The station should go next to a straight part of the track and parallel to it. The others should not be in parallel (or perpendicular) to the track - otherwise you're being boring. If you have several buildings that you plan to line up in a street, consider putting them at a slight angle to the viewing position, so you get a good view of the storefronts, without the sense that they were arranged for your viewing pleasure. Mark everything. For the buildings, you can leave stepping stones in their place for now. If you're using landscaping timbers and you don't plan to cut them, set them around the track the best you can. If you're using edging or masonry of some sort, bring the garden hose over and come up with some sort of graceful form that is more interesting than a rectangle. Mark the boundary you decide on with your spray paint. Lay a layer of newspaper 3-4 sheets deep everywhere you plan to use weed barrier. This isn't critical (it isn't even shown in my diagram), but will protect your weed barrier from anything really obnoxious that is still in your soil, which will in turn, extend the life of the barrier itself. Then begin laying strips of the weed barrier across your future railroad, overlapping the strips by about 6" and trimming them with scissors at each edge, leaving about 6 extra inches. If you have dug a trench for your roadbed, make sure you leave plenty of "slack" to go handle the trenches. Skootch a little extra fabric into each trench and pack gravel on top of it as you go. As you spread the fabric, use your staples to keep it in place as you go. When you roll it where you planned to place a building, pick the stepping stone up as you roll the fabric underneath, then try to put the stepping stone down where you had it. The buildings won't actually be "installed" until later, but this will help you visualize where things will be, and help hold your fabric down at the same time. If you have installed a trench for your roadbed, now's a good time to install the gravel or concrete mix. If you have gravel, pour it gravel into the trench and tamp or stamp it down firmly. If you use Quikrete, it will pack pretty well on its own, but you need to make certain the top is as smooth as possible. Then lay your landscape timbers or masonry blocks or whatever around the outside, folding any "extra" landscaping fabric back on itself if you need to. You may notice at this point that your ground is less even than you thought it was. Use some of the crushed gravel to level things out, to close any gaps underneath the landscaping timbers, etc. Put your circle or oval of track back where you think it should go and make certain it still fits. Install the waterfall if you bought one. If you're going to be installing a waterfall or some such, put that where you want it now, remove the track, and install the water feature, then come back to the track. You may level the water feature by using some of the crushed gravel, if necessary. If you have collected any rocks, or boulders to use on your garden railroad, you may practice setting some of those around to help the water feature look more like it belongs. However final placement of those stones won't probably happen until all of your plants are in the ground. Install the landscape lighting system if you bought one. Actually, if you bought solar lamps, you can wait until later. The only reason for installing a "wired" system now is that, if you want lights both inside and outside the rails, you will need to install track over the low voltage power cord. That's okay, since they don't carry much power. Don't even think about installing track over an extension cord, though. Most low-voltage lamp sets have more wire than you'll really need, but that's okay, wind it around, making sure it goes past each building you plan to light and anywhere you want to have actual lamps or spotlights. Install the 1/2" line for the drip irrigation system if you bought some. Again, my friends in the Southwest stay that this step consists of running the 1/2" line back to the hose bib, then laying the 1/2" on the ground and under the tracks. It will be covered with mulch later, but this way you won't have to disrupt the tracks or the weed barrier to add lines once our plants are in. Pour the gravel roadbed. With the track in place, dump some of the crushed gravel into a small bucket, and walk around your track, burying it a couple inches deep in gravel. The gravel should spread out beyond the ties, as well, so that they are buried along with the rail. Now, shaking the track lightly from side to side, pull the track up through the gravel until only the top of the ties show. (If you pull it completely out of the roadbed, don't panic; you can always add more gravel later.) Tap the track back down to settle the gravel underneath it. Pull any large pieces of gravel out from between the rails, then use a broom to "dust" off the ties and even out the gravel. Applying gravel to hold the track in place is called "ballasting." Level the Track - when you're done with your initial ballasting, Get out your level and make certain that the track is not too far from level. If part of the track seems to be climbing a hill, add more gravel until things are evened out. Above all, you want to avoid a situation where one piece of track is fairly level, and the next piece goes up or downhill. When the overall track plan seems reasonably level, check the track from side to side. The rails should be level across the track as well as lengthwise (although I some times allow my curves to bank slightly). Add more gravel to any low places to make the track more even. When you have a nice, level, smooth railroad, and wipe the top of the rails clean. If you want, you can set out the train, hook up the power, and watch it run. If you notice the train lurching or "catching" someplace, make certain that stretch of track is clean and free of kinks. If you notice the train speeding up and slowing down, your roadbed probably isn't as level as it could be. How paranoid you get about that is up to you. Take the train back off the track and put it where someone won't be kicking it accidentally. This is a good time to set your stepping stones out where you think your buildings will go. Use at least a half-inch of gravel under each stepping stone, and use your level to make them level. Tamp them down into place, and check them again. Being careful not to disturb the weed barrier too much, or to kick your track out of place, set your plants out around your track to decide where you think they will look best. Leave them there as you plant each one - they'll help hold the weed barrier in place, and they'll give you a visual reference for where the next plant should go. Try to avoid straight rows or other "unnatural" patterns. For example, a few clusters of plants with some open spaces in between will be more interesting than a grid of evenly-spaced plants. Also, planting plants is like lighting candles on a birthday cake; you start on the "inside" and work your way out. When you've decided where your first plant should go, use the knife to start a hole in the fabric, then cut an X shape slightly larger than the plant's root system. If you've bought something you need to keep in the pot, dig a hole just larger than the pot, drop it in pot and all, pack it into place, fold the fabric back over the edge of the pot and move on. Note: You may even do this for plants that you are planning to put into the ground "permanently" later if you're in a big hurry or if you want to trim the plant up a little before it goes in the ground "for good." If you are actually planting the plant in the ground sans pot, follow the instructions on the plant's label as well as your time, materials, and patience will allow. If this is a dwarf evergreen, don't worry too much about the instructions to make the hole much larger than the root ball, and back fill with lots and lots of rich planting soil. Those instructions are important if you want to the plant to get big fast - something you don't want. Getting a certain amount of good soil around the tree roots will help it get settled in. Also, ignore or cut back on any instructions related to fertilizer, for the same reason. When your plant is in the ground, fold the fabric back over the loose soil as well as you can and move on. To plant bedding plants, you may cut an H-shaped pattern in the weed barrier, then peel the flaps back to make room. This fall, when the annuals have come out, you can fold the fabric back over and mulch over the top. Once you have an area planted, cut open a bag of mulch and mulch lightly around the plants you have in so far (but not everywhere yet). Stand back and admire your work. If you can water a plant or a cluster of plants without soaking other areas you must work in, do so. Then, avoid the temptation to take a break, and try to get the rest of the plants in the ground. Watch the time. When you feel that you're within two hours of your deadline (three hours if you're installing a drip irrigation system), set the rest of the plants in the shade, water them, and promise them they'll get their turn soon. Install "drippers" if you have them. Cap the 1/2" line at the end farthest from the line to the house. Then, following the instructions that came with your "starter kit," and punch little holes in the 1/2" line and run 1/4" lines with drippers to the individual plants or areas of planting. Now set your buildings out on the stepping stones you leveled earlier. If you guessed wrong about where things would look nice, now's the time to move and relevel the stepping stones. You'll want to keep a bag or two of extra gravel onhand, as the roadbed you poured will spread and settle for a few weeks, and you'll need to reballast the track a few more times this summer before it really settles in. However, if you have a bunch of extra gravel and lots of time, imagine where roads or graveled "parking" lots or driveways would "make sense." Get out some more crushed gravel and "make it so." Tamp or stomp the gravel down to settle it as much as you can over the weed barrier. If you've gotten all of your plants into the ground, set the sprinkler or turn on the drip lines and go inside for supper. Put on mosquito repellent, then come outside. Hook up the power to your track and to any lighting system or water pumps you've installed, making certain that you don't create any safety hazards in the process. If it's not getting dark yet, and you have plants left to go, plant as many as you can before twilight. If twilight comes before you're done, put the rest back again. When you're done testing and planting, or when twilight approaches, whichever comes first, mulch every place that isn't mulched yet. You should have enough mulch to cover the low-voltage wiring and drip line. When you're done mulching, wipe any dust off the top and inside edges of the rails on your track. If there's still enough light to see your railroad, or if you installed lighting, set the train back out, sit back, drink something cold and admire your work for a few minutes. If you haven't run the sprinkler yet, put the train away when it gets dark and set it now. Then put away all of those tools you got out. Go inside and shower. Take an Ibuprophen or whatever won't interfere with your medication. Turn off the sprinkler and go to bed. Check the level and lightly reballast the track every few days until it settles in, usually in 3-4 weeks. Generally you can do this in a few minutes a time, using something like a cottage cheese container to dole out a little ballast where it is needed. You'll also have to lightly reballast after big rainstorms. People who've dug trenches need to do less of this, of course. Wipe the rails off after big rainstorms, or after running trains with plastic wheels on really hot days. If the track gets really cruddy, get an LGB track cleaning block or one of the exra-fine sanding sponges that 3M(Scotch) makes and hit the inside edges and top of the rails. Make certain your new plants have enough moisture to survive and take hold. As your groundcovers spread, you may peel back the weed barrier a little bit at a time so they can root outward. Don't do this for Blue Rug Juniper, though, it doesn't need it and it will give weed seeds a chance to settle in. You can also start daydreaming about what would look great next. In the meantime, take a well-deserved rest. The following list of materials is simply a conservative guidline to help you keep from having to make an extra run to the store for something you forgot or ran out of. Feel free to adapt as you desire, but keep your receipt, in case you seriously overpurchase something by mistake. When estimating quantities, remember that your track should never be closer than about 6" (a reasonable safety margin) from the edge of the railroad. That said the sample requirements listed below are just that, samples. They are suggestions only, based on a few people's experience, and the desire to keep you from having to run back to the store for something in the middle of the job. Your mileage will vary, depending on the final shape of your railroad, how level your ground is, and many other factors. In addition, I have prepared a worksheet that contains most of the material on the following lists in a table format. It is available as a PDF file that can be printed with Adobe Acrobat and as a MicroSoft Excel spreadsheet that you can use to calculate your overall costs for each size of railroad specified (be certain to change the quantity and cost figures to meet your personal requirements and the local cost of materials). Note: You are permitted to print and use the worksheets for your personal use; however they are copyrighted material and may not be published for general use or used commercially without prior written permission. Also, if you have trouble downloading either file, please contact me, and I will email it to you directly. The following list describes four general sizes of railroads that you might choose to build. Small but relatively easy - If you're using a 5-foot circle of track, and you want a square railroad, your railroad will be a minimum of 36 square feet in area and require a twenty-four foot border. This will look slightly less cramped than the 4'-circle railroad, but you still won't have the sense that the train is "going anywhere." Still, it's a way of "getting your feet wet" and trying out the whole hobby before you invest a fortune into it. Once you have everything you need and you get started, you should be able to finish this railroad in less than five hours (less if you have good help). A Little Larger, but still doable in one day - If you're using an 8-foot circle of track, and you want a square railroad, your railroad will be a minimum of 81 square feet in area and require a 36-foot border. This railroad will take most of your day, so if you can get your supplies or get started the night before, it will help. Once you're done, however, you'll be able to get more of a sense that the train is actually going someplace. Plus you have room to add more interesting scenery, etc. later on. This railroad should take you about seven hours after you get started, more if you went crazy on buildings and plants, less if you have enthusiastic help. 36 foot of border material (for example: 54 8-inch pavers). Please make more than one trip for this unless you have a very large pickup truck. 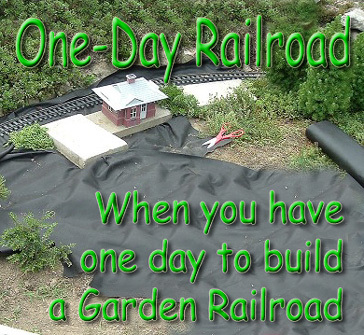 About the Maximum for a One-Day Project This is still a small railroad by "normal" garden railroading standards, but it can be done in a day with a little help, and it provides enough room for a great deal of interesting additions. If you're using a 10-foot circle of track, and you want a square railroad, your railroad will be a minimum of 121 square feet in area and require a 44-foot border. You probably won't finish this one in one day unless you get your supplies, assemble your track, and plan the outline of your railroad ahead of time. It will be more rewarding in the long run than the smaller railroads described on this page, though. If you have the room for it, the time to install it, and the funds for the extra materials, it will be well worth it. I would especially consider this option if you are planning on leaving this railroad installed for three years or more or buying more trains later. This railroad should take you about ten hours after you get started, more if you went crazy on buildings and plants, less if you have enthusiastic help. Any additional straight pieces or other track, in case you have room for an oval or some other shape. If you do make your railroad larger than just the circle example we're describing here, you'll need to increase the quantities on the rest of this list accordingly) Note: A friend who has installed several garden railroads says that he recently installed a railroad that was about 10' by 20' using similar methods and materials in one day. So if you have level ground, the room to spread out a little, and a whole weekend to work, don't be too shy about giving your train some room to run. 44 foot of border material (for example: 66 8-inch pavers) Please make more than one trip for this unless you have a very large pickup truck. In case you don't have the tools you need, here's a short checklist, followed by a long list of things you might find yourself looking for at the Garden Supply and or Hardware Store. Remember, if you are building one of the larger railroads described on this page, you will probably want to make at least two trips to save your vehicle's axles, springs, and tires. ___ 1/2-cubic foot bags Crushed Gravel: at least 3 bags for every 6 feet of track, plus one bag for every four buildings, more if the ground is uneven. ___ Other Perennials, as desired. Use plants with very fine foliage and 12" maximum height. ___ Bird feeders or Birdhouses? ___ Drip Irrigation Starter Kit?